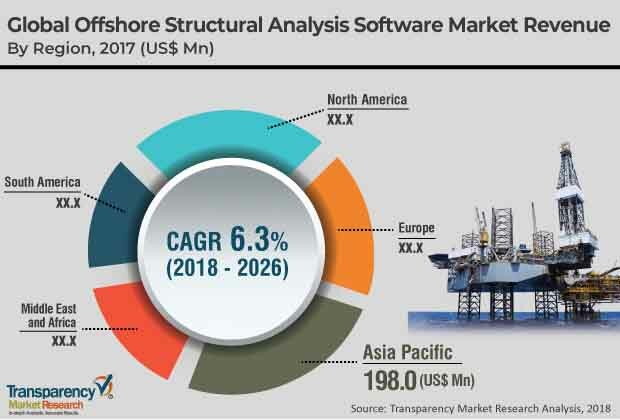 According to a new market report published by Transparency Market Research, the global offshore structural analysis software market is projected to reach US$ 818.1 Mn by 2026. The market is expected to expand at a CAGR of 6.3% during the forecast period from 2018 to 2026. Furthermore, software is expected to account for highest market share in the year 2018 due to rising demand for cloud based engineering software that provides greater ease, storage, and security. Asia Pacific is anticipated to lead the global offshore structural analysis software market during the forecast period, followed by North America, Europe, Middle East & Africa, and South America. Today many industries face a unique set of challenges in an increasingly competitive marketplace. 3D designing plays a crucial role in various sectors. 3D technology can help with the toughest engineering problems. 3D software helps to build innovative designs and drives business. 3D design technology enables the rapid transformation of new ideas into great products. 3D experience platforms for offshore help enhance how offshore structures are designed and built. 3D modular design enables companies of any size to design the exact type of system that meets their workload and workflow requirements. For instance, Intergraph, an American software development and services company offers a full suite of solutions of all the capabilities required to build and design different types of marine assets. The company’s 3D offshore software boosts production flexibility and reduces the time taken to design and construct world-class facilities. The global offshore structural analysis software market has been segmented based on component, end-use industry, and geography. Based on component, the market is segmented into software and services. Asia Pacific led the global offshore structural analysis software market, accounting for substantial share in 2017.China is the major market for offshore structural analysis software in the region. Offshore structural analysis software is also gaining popularity in other Asian countries such as Indonesia and South Korea.The market in North America, Europe, Middle East & Africa, and South America is expected to expand at a rapid pace during the forecast period.